"At Veterinary Vision we frequently use the diode laser from IRIDEX for treating a variety of conditions including uveal, limbal and eyelid melanomas, and iris cysts. There are many delivery systems available, including the operating microscope adapter (OMA), retinopexy, EndoProbe® and transscleral probes, allowing the laser to be delivered in both contact and non contact modes. Diode laser treatment for glaucoma includes transscleral and endo cyclophotocoagulation techniques offering some of the best options available for treating this challenging condition." The DioVet laser system is used worldwide by veterinary ophthalmologists to treat glaucoma, retinal disorders, and pigmented tumors. The 810 nm laser wavelength enables transscleral cyclophotocoagulation for glaucoma and retinal procedures. 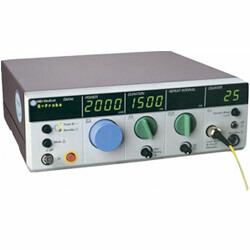 The small size of the DioVet laser system allows easy transport of the equipment to multiple clinics or remote.